The more we look, the more we find bubbles of methane, a greenhouse gas, leaking from the ocean floor (e.g., ). Some of the methane in these gas bubbles may travel to the ocean surface where it enters the atmosphere, and some is consumed by microbes, generating biomass and the greenhouse gas carbon dioxide in the process . Given the vast quantities of methane thought to be contained beneath the ocean seabed , understanding how much methane goes where is an important component of understanding climate change and the global carbon cycle. Fortunately, gas bubbles are really easy to observe acoustically. The gas inside the bubble acts like a very soft-spring compared to the nearly incompressible ocean water surrounding it. If we compress this spring with an acoustic wave, the water surrounding the bubble moves with it as an entrained mass. This simple mass-spring system isn’t conceptually different than the suspension system (the spring) on your car (the mass): driving over a wash-board dirt road at the wrong speed (using the right acoustic frequency) can elicit a very uncomfortable (or loud) response. We try to avoid these conditions in our vehicles, but exploiting the acoustic resonance of a gas bubble helps us detect centimeter-sized (or smaller) bubbles when they are kilometers away (Fig. 1). Methane bubbles rising from the ocean floor undergo a complicated evolution as they rise through the water column: gas is transferred both into and out of the surrounding bubble causing the gas composition of a bubble near the sea surface to look very different than at its ocean floor origin, and coatings on the bubble wall can change both the speed at which the bubble rises as well as the rate at which gas enters or exits the bubble. Understanding the various ways in which methane bubbles contribute to the global carbon cycle requires understanding these complicated details of a methane bubble’s lifetime in the ocean. We can use acoustic remote sensing techniques, combined with our understanding of the acoustic response of resonant bubbles, to help answer the question of where the methane gas goes. In doing so we map the locations of methane gas bubble sources on the seafloor (Fig. 2), measure how high up into the water column we observe gas bubbles rising, and use calibrated acoustic measurements to help constrain models of how bubbles change during their ascent through the water column. Not surprisingly, working on answering these questions generates new questions to answer, including how the acoustic response of large, wobbly bubbles (Fig. 3) differs from small, spherical ones and what the impact of methane hydrate (methane-ice) coatings are on both the fate of the bubbles and the acoustic response. Given how much of the ocean remains unexplored, we expect to be learning about methane gas seeps and their role in our climate for a long time to come. Skarke, A., Ruppel, C., Kodis, M., Brothers, D., & Lobecker, E. (2014). Widespread methane leakage from the sea floor on the northern US Atlantic margin. Nature Geoscience, 7(9), 657-661. Kessler, J. (2014). Seafloor methane: Atlantic bubble bath. Nature Geoscience, 7(9), 625-626. Ruppel, C. D. “Methane hydrates and contemporary climate change.” Nature Education Knowledge 3, no. 10 (2011): 29. Figure 1. 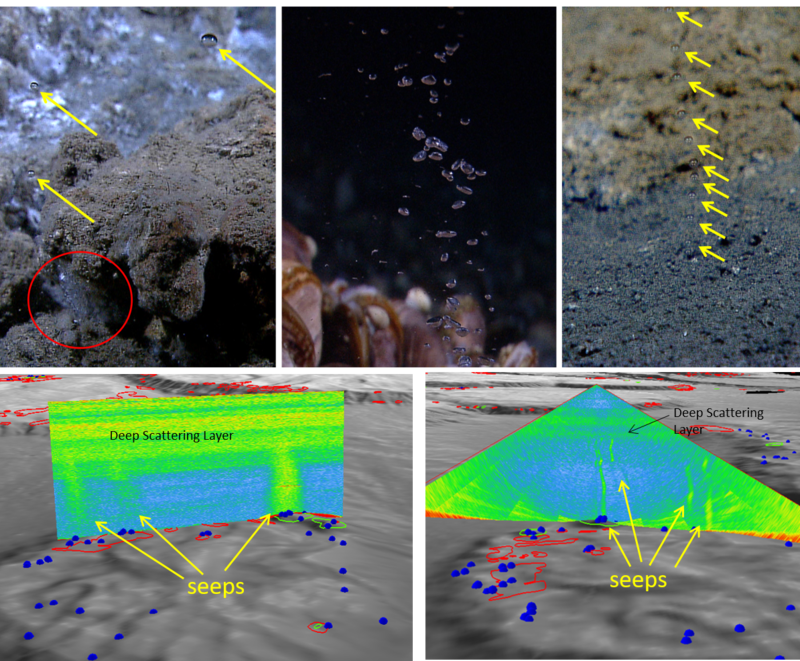 Top row: observations of methane gas bubbles exiting the ocean floor (picture credit: NOAA OER). The red circle shows methane hydrate (methane ice). Bottom row: acoustic observations of methane gas bubbles rising through the water column. Figure 2. 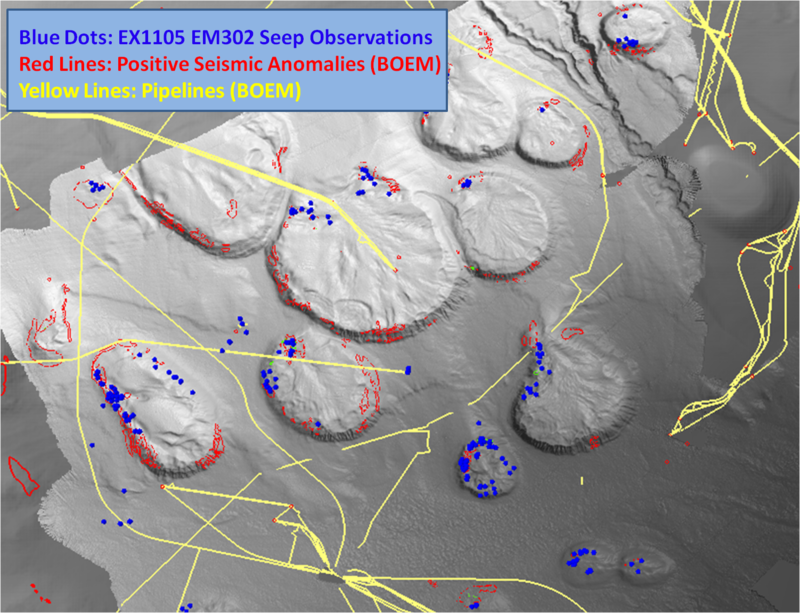 A map of acoustically detected methane gas bubble seeps (blue dots) in the northern Gulf of Mexico in water depths of approximately 1000-2000 m. Oil pipelines on the seabed are shown as yellow lines. Figure 3. 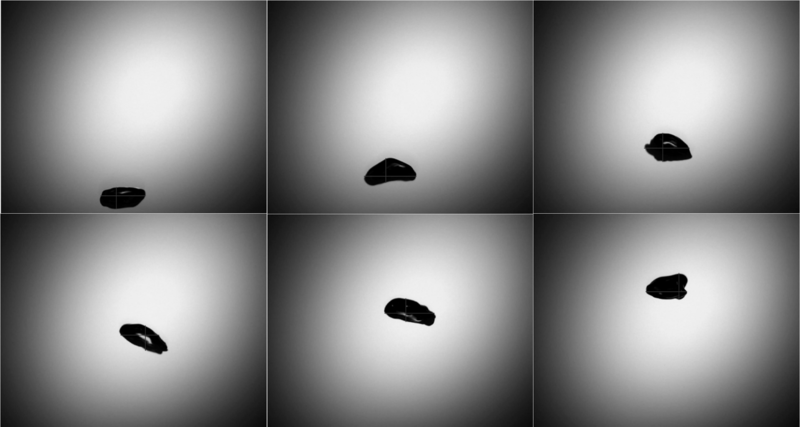 Images of large, wobbly bubbles that are approximately 1 cm in size. These type of bubbles are being investigated to help understand how their acoustic response differs from an ideal, spherical bubble. Picture credit: Alex Padilla. WASHINGTON, D.C., May 20, 2015 — Recently, scientists from Swinburne University of Technology in Australia and the Commonwealth Scientific and Industrial Research Organization (CSIRO), have jointly demonstrated cream separation from natural whole milk at liter-scales for the first time using ultrasonic standing waves–a novel, fast and nondestructive separation technique typically used only in small-scale settings. At the 169th Meeting of the Acoustical Society of America (ASA), being held May 18-22 2015 in Pittsburgh, Pennsylvania, the researchers will report the key design and effective operating parameters for milk fat separation in batch and continuous systems. “These streams can be further fractionated to obtain smaller and larger sized fat globules, which can be used to produce novel dairy products with enhanced properties,” Leong said, as dairy studies suggested that cheeses made from milk with higher portion of small fat globules have superior taste and texture, while milk or cream with more large fat globules can lead to tastier butter. Leong said the ultrasonic separation process only takes about 10 to 20 minutes on a liter scale – much faster than traditional methods of natural fat sedimentation and buoyancy processing, commonly used today for the manufacture of Parmesan cheeses in Northern Italy, which can take more than six hours. The researchers’ next step is to work with small cheese makers to demonstrate the efficacy of the technique in cheese production.